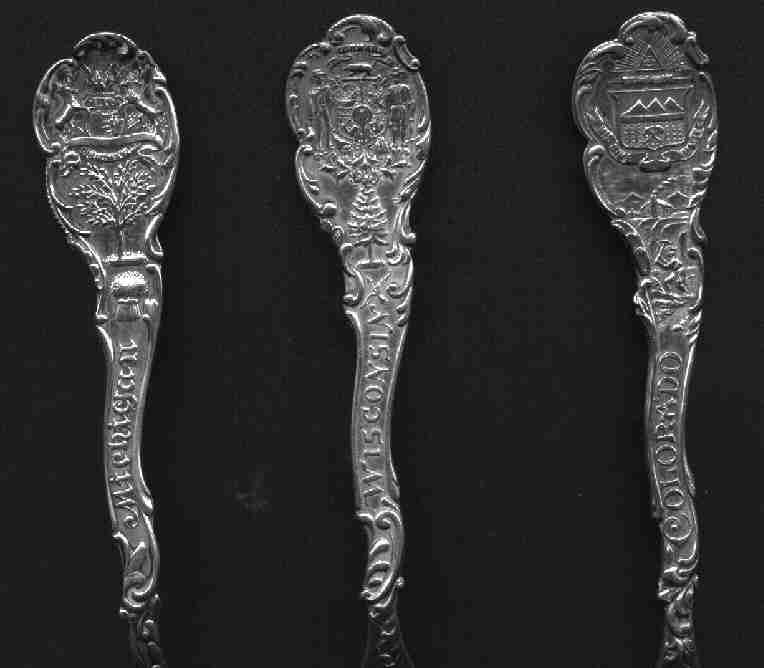 Many Spoon Companies made state handled spoons. 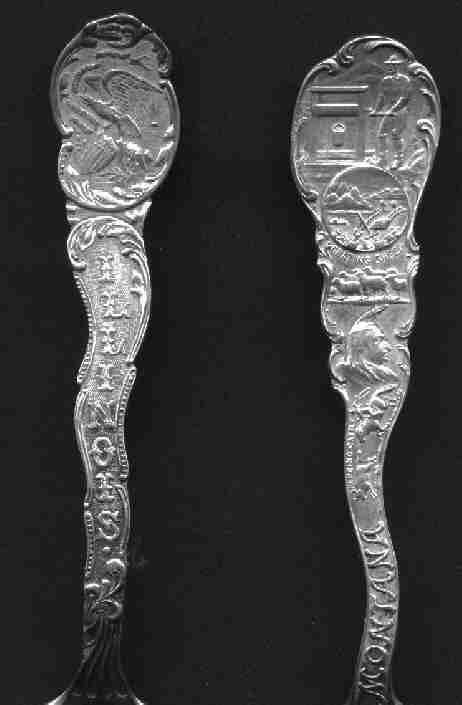 These spoons usually have the state name on the handle, the state seal, and sometimes other views from around the state. The bowl was usually customized for the specific city or site where it was to be sold. On this page I am highlighting the Shepard series of "Wavy Handles". In my opinion these are the nicest of the state seal spoons. These spoons were very popular with the jewelers and with the buying public. It is possible to find most of the states. These spoons are not particularly expensive, but they make nice display pieces. These spoons were NOT sold as a series. 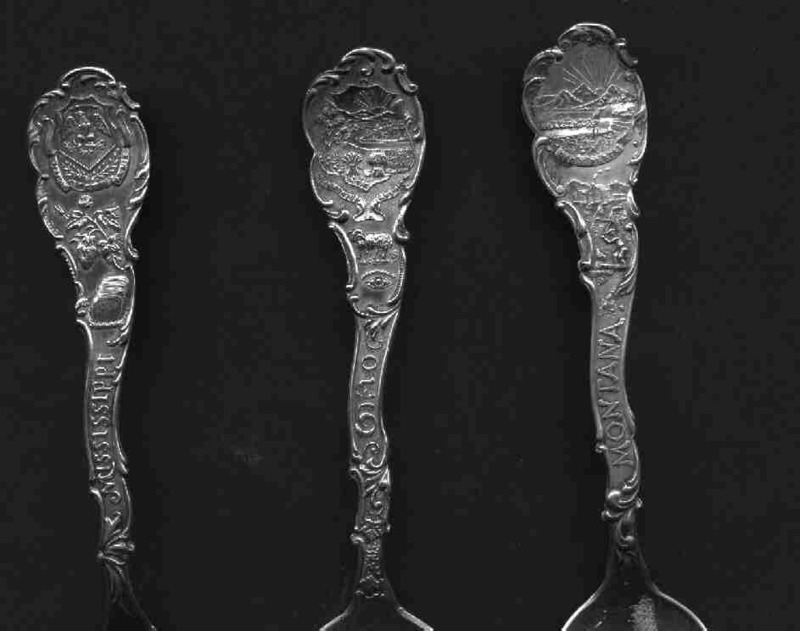 The spoons were made by state as needed and then customized as the jeweler requested. If you ever find 50 of these old spoons being sold as a set--buy it as it would be extremely rare. Do not get this statement confused with the cheap silver plated "American Collectors Guild" spoons that were sold as a series. Some collectors try to acquire one spoon from each state. This approach has never interested me. I acquire these spoons based upon the bowl customization. Each person to his own tastes. This is a test to see what public reaction is. If you would like to see other types of state handle spoons contact me (or buy the book which also shows the various varieties). 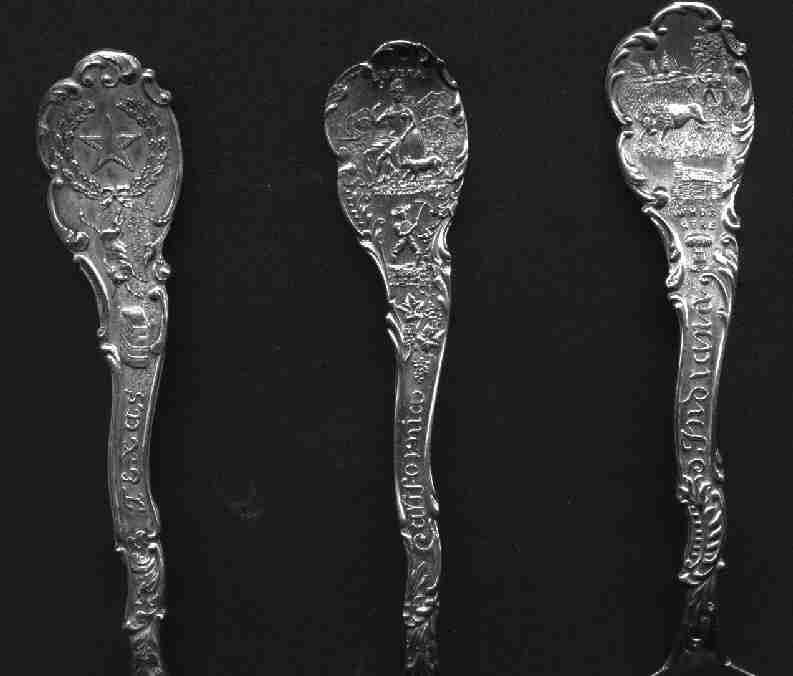 The Shepard wavy handle spoons were so popular that some other manufacturers created similar "look-a-likes". Both Towle and ELD were quality manufacturers and their spoons are quite nice, but neither produced as many varieties as did Shepard. Most of the Shepard spoons do not have any design on the back, but it could be customized as required. The California and Michigan spoons have this image of "justice"
The ELD spoon from Montana has this neat picture of a miner.